It all started with an innocent conversation about Shutterfly, you know, the website where you can order pictures. 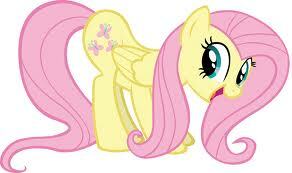 "Do you mean Fluttershy?" asked my son. "Because if you do, that's a My Little Pony and I'm a member of the My Little Pony Club." "Isn't that something your sister had when she was three?" I asked. "The plastic ponies with the sparkly mane and tails?" My daughter and I giggled, but now, three months later it seems my son is having the last laugh. We are in the midst of a full-on My Little Pony craze. My daughter is a convert. She knows all the characters and their cutie marks (yes, I just said cutie marks). At breakfast I overhead a conversation comparing my friend Georgie to one of the ponies. "Yeah, she's totally a Pinkie Pie," said my daughter. "She and Pinkie Pie love to give parties." "Which pony am I?" I asked. "You're Rainbow Dash," my son said. "You're always dashing off on adventures." The conversation shifted to how one of the ponies was lucky enough to get a princess babysitter who also happened to be a unicorn and I rainbow-dashed out of the room before my ears started to bleed. Later that morning I ran into the mom whose son is the root cause of the second-grade boys' My Little Pony obsession. "It's a counter-culture hipster thing," she explained. "Even my fourteen year old is into them. She's getting my son a 'Brony' t-shirt for his birthday"
Apparently My Little Pony is so ridiculous it's done a 180 degree spin and become cool. 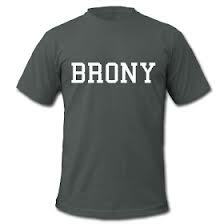 And in case you didn't know, 'Brony' is the term for a guy who's into My Little Pony. I'm considering a My Little Pony themed birthday party for my soon-to-be nine year old son...which is a sentence I never expected to write. And as long as I'm at it, I might pick him up a Brony shirt (in black of course, because he wants to be a Ninja-cool Brony). If he's getting a Brony shirt, my daughter should probably have an "I'm a Peg-a-Sister" shirt. 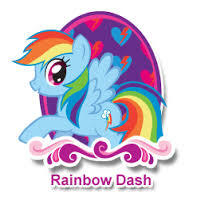 Maybe I'll even pick up a tank top for myself, with the Rainbow Dash cutie mark, of course! But I draw the line at buying the plastic action figures. Although, as I think about it, a summer of My Little Pony pretend play is probably not the worst thing in the world. If anyone laughs at us, we'll tell them we like it ironically. And then we'll remind them this is Portlandia, home of the Naked Bike Ride and a place where people bring their urban chickens to work because they can't bear to leave them home alone. Ah Portlandia....if there's any place to get your alternative-hipster My Little Pony fix, this is it. Glad I missed that craze the first time around. A few weeks ago, I had a garage sale where my girls got rid of a lot of their Playschool plastic books and toys (This was a little hard and sad for me, my girls are growing up, sniff, sniff) Anyhow, I was shocked at how many people rolled up and asked if we had any My Little Pony stuff. It happened all day long! Now that I am reading your post, I finally understand why! OMG--Miss Meg was full on Pony Freak! I can somehow see my son becoming a Brony. He's the boy who hate seeing naked Barbies so much, he made little outfits for them using lone-socks (you know, the ones whose mates have vanished into the sock-universe.) Thus my twelve year old son was the couturier to his seven year old sister and her friends' Barbie collections, This led to his making small saddles and outfits for--you guessed it--the Ponies. Portlandia is not the only weird place in the wild Northwest. It's simply our flagship town! I remember My Little Pony; I didn't know they still made those! I think I had one when I was younger. When I was a kid, I remember thinking that adults probably got bored because they didn't have any toys to play with. Seriously? Oh my. I remember my niece loving anything Little Pony. She's 23 now. Her 5 year old likes to play with some of Deanna's old ponies--she combs the manes and makes up stories. Dee did give one to my son (who is like her little bro) when he was little. I think he still has it in a drawer. I think he only kept it because it was from his big sis. Alex, apparently it's not too late! Neurotic, we do have toys. A big one called the internet. My daughter loves them too. Heck, even my boys like them. They're so fun! Ermagherd, seriously????? I was happy to have boys to avoid the whole long-maned sparkly pony phase! But if it's in Portland, I say go for it! And I'd LOVE to hear more about those urban chickens!!!! Wow. That all spun by too fast for me. Unfortunately the My Little Pony of today is nothing like the awesomeness it was in the 80's. Have fun with that! LOL! 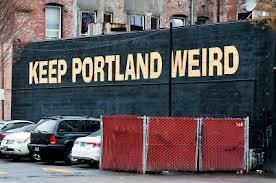 Portland is in no danger of not being weird. That's cute the kids are excited about My Little Pony now. I never had one but I always say my smallest cat Rocko is like My Little Pony, except smaller. I must admit to liking the new My Little Pony show. It's funny and innocent, and after my sons watch it they think more about friendship (i.e. other people). Of course, I've always liked animation in general, so I might not be like most adults! I'm just saying I liked it when I actually watched it, even though I didn't expect to. You'll have to let me know if you ever watch it--and what you think of Rainbow Dash! Wow! Just when you think you have heard it all...Little Pony appears in a nightmare. Austin, Texas also has a sign that says "Keep Austin Weird". Must be a movement! Oh yes, I know 'bronies' who are MY age. Now, I love a lot of ridiculous things, but little pink magical ponies are NOT one of them.